This is the Ground Observations discussion thread for the 2010-2011 season of the Hornby webcam eagles! May they, & all the eagles & birds & mammals & fish & reptiles, have a good healthy year this year!! Mishi & i were in the Nest Tree neighbourhood early saturday evening. i knew right away that she had something important to tell me. & they sounded VERY familiar! Then the starling did their Dad imitation, over & over. Was this what we had actually heard? Had the starling pulled our leg? We quickly ran to check all the perch trees. No sign of an eagle. i felt foolish, that i hadn*t been able to tell the sound of an eagle from the sound of a starling imitating one. & i had been so happy to think that Mum or Dad had returned! i was greatly relieved when we visited chat, to hear that they had heard a double eagle trill, at the time that we did! So an eagle WAS back, as of saturday evening. mishi was up & at *em way earlier than i was sunday morning. So she took Dooki, & off they went to the Nest Tree neighbourhood to see if Mum or Dad were in sight. Mishi came back all a-quiver! She pulled out her camera & showed me fotos of an eagle in the Peters*s Tree! So, one of them is back. i returned to the area with her, & my camera. We saw nary an eagle. Good thing, as when i turned on my camera, the battery had run out. Sunday evening, mishi took Dooki for a walk to the Nest Tree neighbourhood. She went to Grassy Point. On her return, she was headed one way up Grassy Point, but Dooki pulled her in another direction to sniff something. While he sniffed, she suddenly heard a crack, crack! sound. 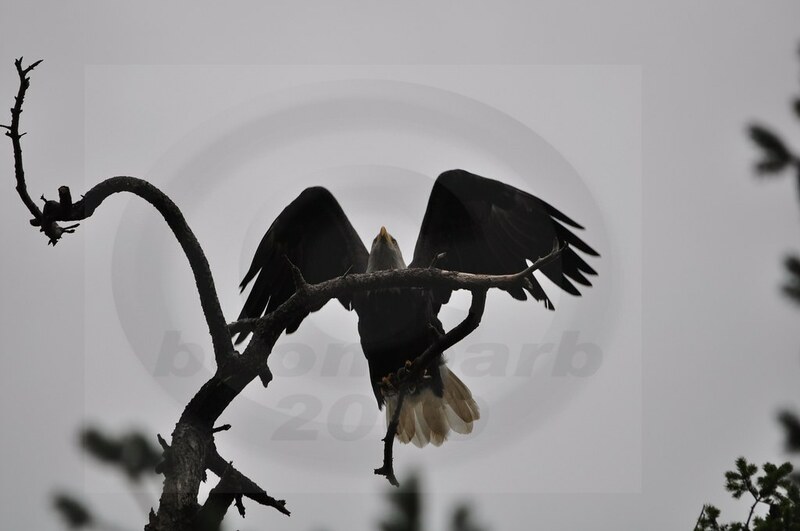 When she looked up, there was an eagle, maybe twenty feet above her head, with their feet still partly hanging down. The eagle was so close, she got a very good look at them. They flew over & around, then off again. i believe the cracking sound she heard was the sound of the wings & the feet/talons leaving the branch of the tree where they had been perched. This was quite likely Mum or Dad, but there is no way to know for sure. Today, at about 14:50, trills were heard from the nest. I was working outside and heard them too - and it seemed familiar, but maybe a bit low for Dad... I got on my bike and went to check out the nest neighbourhood. There was SOMEONE on the babysitting tree... My eye is not practised enough to tell who it is. And I looked around and saw no-one else in the nest neighbourhood, so there are no more clues. Wren, thank you so much for getting that picture! Wren, that is so exciting! You must have been very pleased to see her/him! How do they balance on such a small perch?! Thank you for sharing this picture with us! My guess would be maybe it was Mom? Regardless of whether it was Mom or Dad; I'm just happy, happy to see and hear one of them again. Dad is around and he will know who it is. Both Mom and Dad are very territorial!!! I wouldn't want to have either one chase me! I magnified Wren's photo and I feel that this is a female (based on tail and wing), that the middle toe looks like Mom's, and that the small spot at the commissure might be visible. If it looks like a duck and quacks like a duck, on the babysitting tree at that... cachunkachunka. The calls coming from that tree were unmistakably Mom. So be it Ajl! Woohoo! Next Nestorations and Hanky Panky! Okay, so since Mum was declared back on sunday, i have been trying really hard to see her. Every time i went by, i saw nary an eagle. i figured it was because of the windy wet weather we*ve been having. The eagles must all be off elsewhere, hiding out. Today i passed by the Nest neighbourhood just before 8am, on the way to work. There was an eagle in the Peters*s Tree! i figured this was Dad, & i had to get to work, so i carried on. On my way home from work, i passed by the neighbourhood again. Again there was an eagle in the Peters*s Tree. Well, i had brought my camera with me, just in case, so what the heck, i may as well stop & at least get a nice foto of Dad so we can see what he looks like after the salmon runs. So, i grabbed my camera & headed that way. 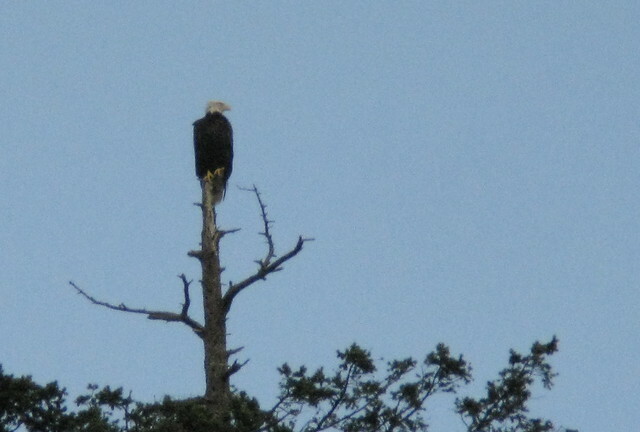 As i was walking towards the tree, i looked up, & there was the eagle in the tree, looking right at me. i looked right back, really glad to see whoever it was again! i set up my camera & started taking fotos. The first thing i noticed was that the eagle was not in Dad*s spot. Was this Mum? ? ? ? ? i watched & watched, & just was not sure. But i had a feeling this was, indeed, Mum. It was SO GOOD to see her again. She was looking about, blowing in the wind, once in a while looking right at me for a second, & then looking away. Suddenly she flared her wings. Was she going to take off? Off into the air she went, then out a short ways over the ocean, doing a large loop. Was she going to come back & land again? i kept watching her, but she flew inland, out of sight. i kept watching, thinking she would circle back. When she didn*t, i checked the fotos i*d gotten of her take off. Look at the nicks still evident in the #6 left primary feather! Seems the #5 feather, which was still nicked last time i saw her, has moulted & grown in clean. But the #6 nicks are loud & clear in identifying this eagle as Mum!! !